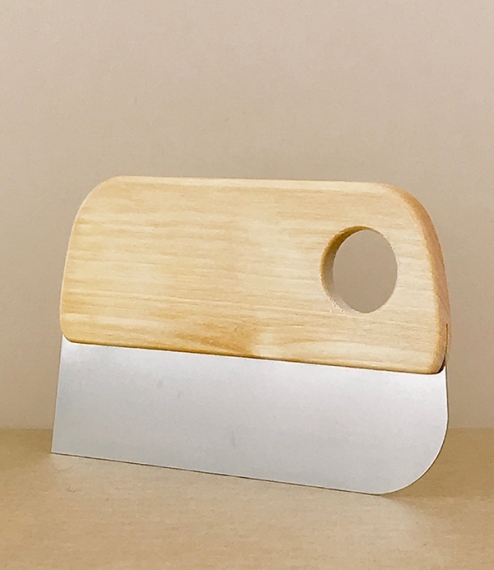 A stainless steel and oiled birch dough and pastry scraper used to stretch, turn, cut, work, and portion dough, as well as for scraping clean working surfaces after use. The Swedish tradition of visually impaired craftsmen finding work in the manufacture of brushes and household tools continues today in the form of Iris Hantverk, which employs over 30 such individuals producing some of the world’s most beautiful and high quality brushes and tools. Approximately 15cm by 9.5cm by 0.8cm.